The cabbage maggot is a very destructive insect, attacking crucifers such as cabbage, broccoli, cauliflower, Brussels sprouts, radishes, rutabagas, and turnips. All cool-season plants. Wilting leaves are usually a sign of maggot damage and indicate that roots need to be checked for maggots. Cool weather is necessary for the cabbage maggot’s emergence, which takes place over a 2 to 3 week period. This extended period of emergence, added to the lifespan of the fly, exposes seedlings and transplants to a 30-day egg-laying period. There are 3 to 4 generations per year. The insect overwinters as an egg-shaped pupa buried in the soil. Flies first emerge and mate during May. The females deposit their eggs at the base of plants. In 3 to 9 days, the white tapered, legless maggots (larvae) emerge from their eggs. The maggots move to the root zone where they feed, damaging or sometimes destroying the root system. Larvae feed for 20 to 30 days, until they are mature (1/4 to 1/3 inch long) and ready to pupate. The first spring generation is the most damaging. Adult flies emerge in 10 to 14 days. 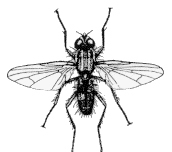 The flies resemble houseflies, but are 1/4 inch long with black stripes on the thorax. Because of the variation in time of adult emergence in the spring and the variation in length of developmental stages, it is possible for maggots to be present much of the growing season. However, high temperatures and disease suppress populations in July and August. The cooler temperatures of September and October favor development. At that time, the maggots damage fall-maturing plants such as rutabagas, turnips, and Brussels sprouts, as well as other late crucifer crops. It is important to remove roots, root crops and other host plants, and destroy them in the fall. Destroying wild host plants, especially the mustards, at any time will help. 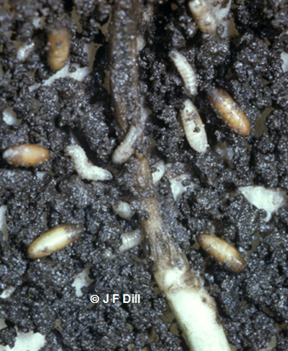 Fall tillage may also expose over-wintering pupae to predators and drying. Use resistant or maggot-tolerant plant varieties if cabbage maggots have been a problem in previous years. Good soil fertility will help damaged plants overcome injury. Beneficial nematodes can be used to protect new transplants. There are ways to prevent maggots from getting to the root zone. A small piece of plastic, slit in the middle, wrapped around the plant stem and overlapped, can be taped or covered with soil. Another method uses 2 pieces of plastic about 12 inches square, pulled together around the plant from opposite sides and held down with soil. Screening or spunbonded row cover will keep egg-laying flies off the plants.